I keep a secret list. It has every good idea for a startup I’ve had. Are any really good ideas? I haven’t done the work to find out. The first step would be to explore them in depth, maybe with an essay. The real test is actually doing it. I’m on my second startup right now, YesGraph. YesGraph helps grow by recommending exactly who a user should invite. I’ll probably work on it for a long time. If things go well, a really long time. So what am I doing sitting around on this pile of other ideas? There is a tinge of fear that if I open up, I’ll somehow lose out. Upon reflection, I think this fear is baseless. If the idea is bad, I will have lost nothing in opening up. I might even be convinced it’s bad and avoid wasting my time working on it. If the idea is good, but I don’t get around to it, I will have lost nothing in opening up. I might even help make the world a better place by helping others execute better on a similar idea. 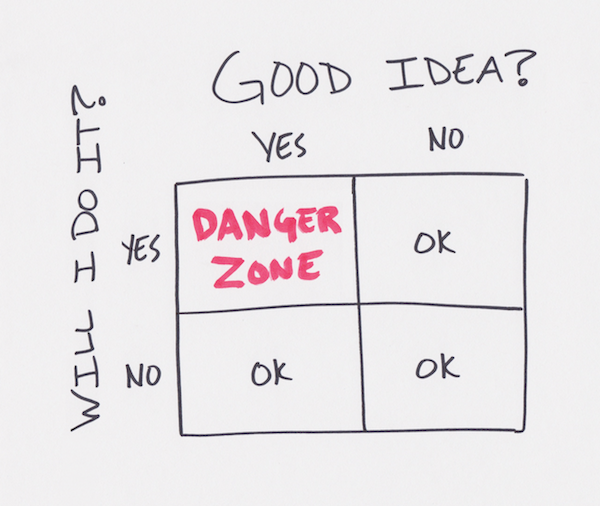 The danger zone is when an idea is good and I do get around to doing it. Then opening up about the idea early on might cost me because someone else takes and executes well on the idea. This is where my hesitation dwells. But I recently changed my mind about this. It was because of a story about company called Mosaic doing crowdsourced solar financing. I had that idea years ago! In fact, I think they’re not doing it quite right, but I sound dumb by saying so. Where is a the credit? Why don’t they ask me for what I’d do differently? Keeping quiet has a cost. It turns out this is a frequent frustration if you have a lot of ideas. Every entrepreneur is trying to find the adjacent possible, which is why it is so common for good ideas to happen at the same time in different places. Everyone has their own ideas, so it isn’t likely that someone takes an idea from me. But if I publish the idea openly, I’ll get a lot of feedback about the idea. Early on, feedback from people you trust is the most important to develop a young idea into something real. This is why keeping your startup stealth even in private conversation is a horrible idea. Then there is my startup, YesGraph. Did I mention we help your app grow? Well, we do, and I’m completely focused on making it work. For all practical purposes, these other ideas aren’t useful to me when I’m focused on the one, current company. So i’m going to give them away. The raw list below is useless if you don’t have the context. I’ll take the best ideas, spell them out in detail, including some UI sketches, growth strategy, and initial important questions. I’ll post them here, and wherever else I can get attention. If you want to follow along, subscribe to get these blog posts via email. 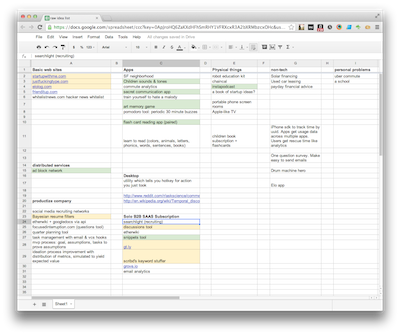 Thanks to Jamie Quint, Nikhil Kalghatgi, Tom Williams, and Soleio for helping refine this post.